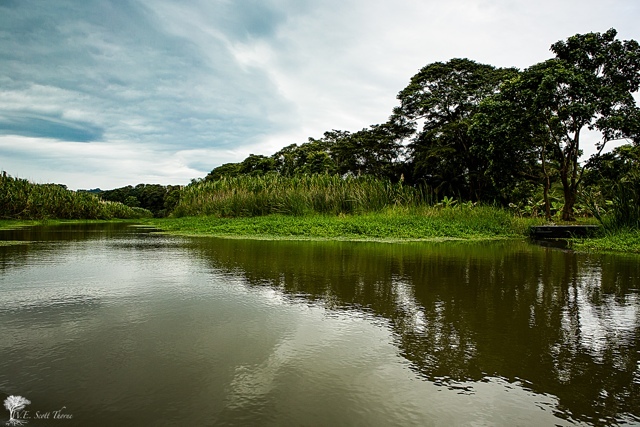 While traveling through Costa Rica, I took a lot of photos like I normally do however this time I was also traveling with my friend and professional camera man Scott Thorne. I’ll admit it now his photos are way better than mine and here are some of his favourites that I have selected to share with you! 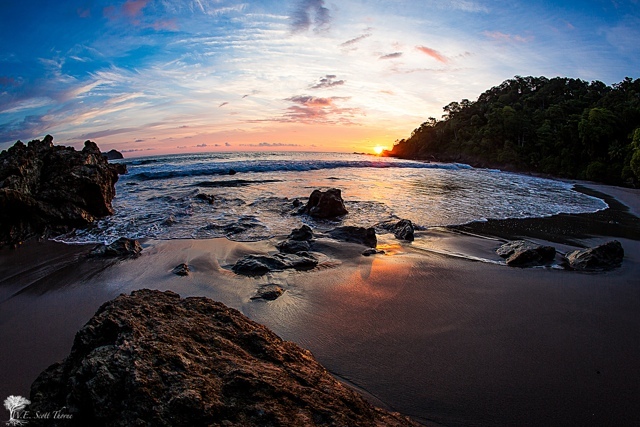 One of our favorite places that we stayed at in Costa Rica was the Arenas Del Mar Luxury Hotel which sat in front of the Playitas Beach that had beautiful sunsets each night. 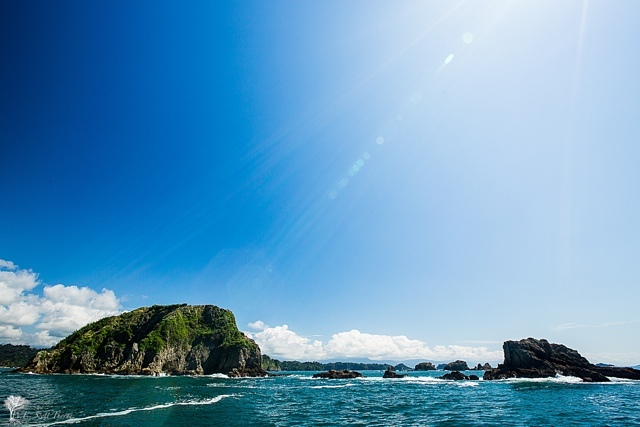 While in Quepos and the Manuel Antonio area on the west coast of Costa Rica Latitudes Adventure booked us on an afternoon Catamaran tour where we had amazing weather and saw some great views like this. 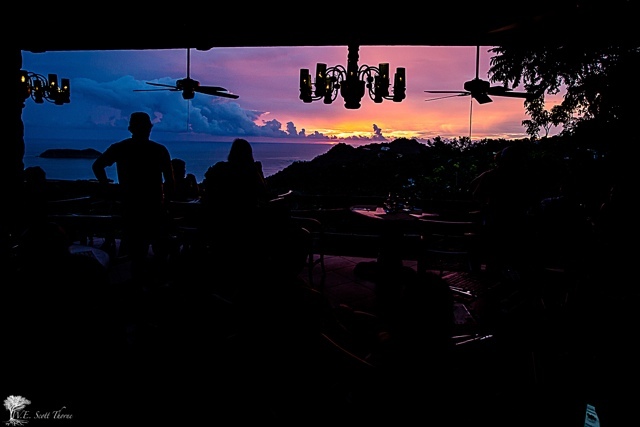 A restaurant that we frequented a couple times on the west coast was called “El Avion” and aside from having a full size plane as part of the bar it also was a nice spot for watching the sunset over the ocean. A slow relaxing paddle down the river as part of the Insiders Tour at the Sloth Sanctuary. 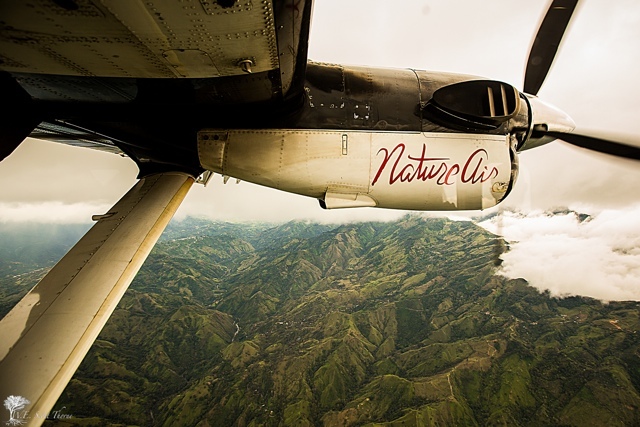 We flew in a small plane from San Jose to Quepos, Costa Rica and this was one of the many luscious green views we saw over a town. 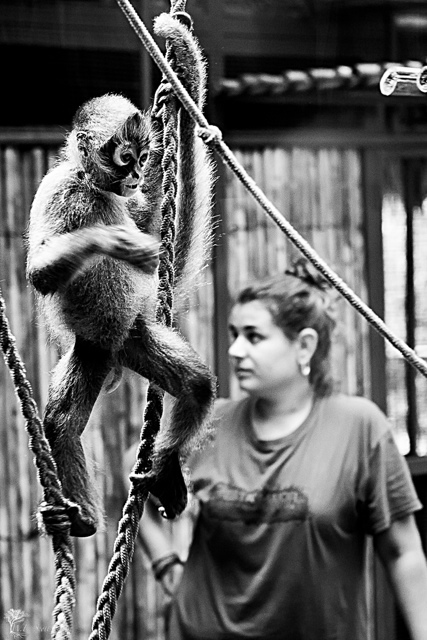 There were a lot of wild monkeys that were cute and being up to no good around one of our hotels. A unique experience to see these guys in the wild but I can’t stop thinking that this one looks a lot like the Marcel from “Friends”. 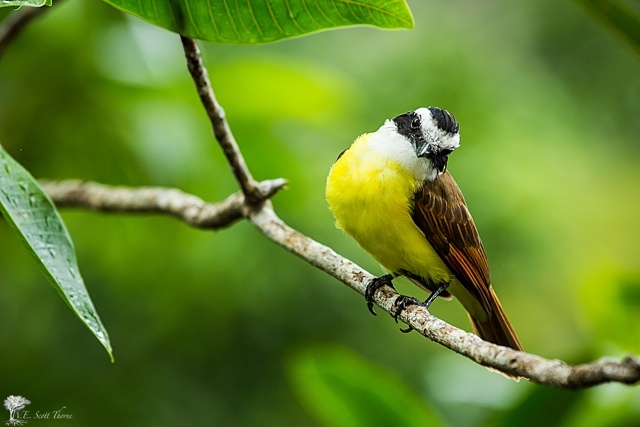 Costa Rica is also a popular destination for birders, as you can see why. This was a rare flower that we saw in the Manuel Antonio Rainforest and National Park. 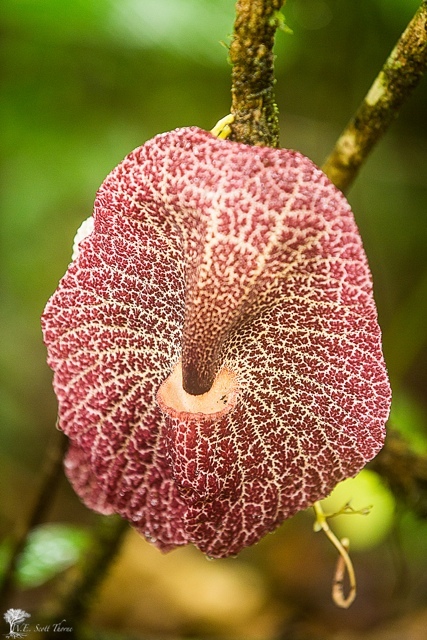 I believe it is called a “Aristolochia gigantea” but I’m not sure. Really different, but beautiful. 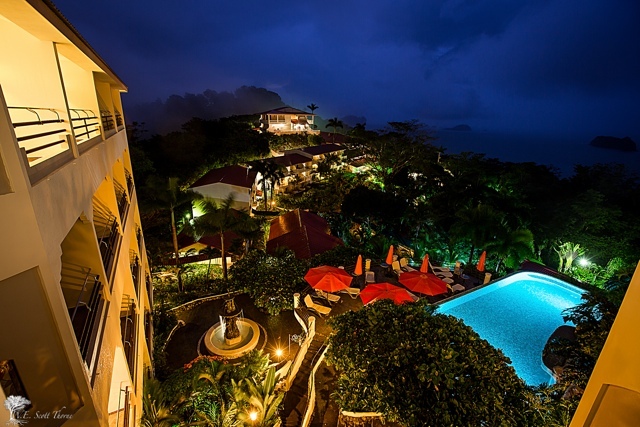 A night view over our hotel, Hotel Parador Resort and Spa near Manuel Antonio National Park. Driving between San Jose and Limón, Costa Rica we visited the Braulio Carrillo National Park where we took an aerial tram ride through the treetops of the rainforest. 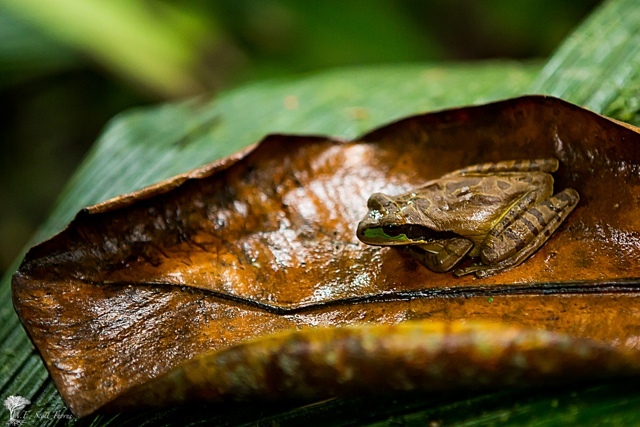 A cute frog hiding out on a dead leaf at the Braulio Carrillo National Park. 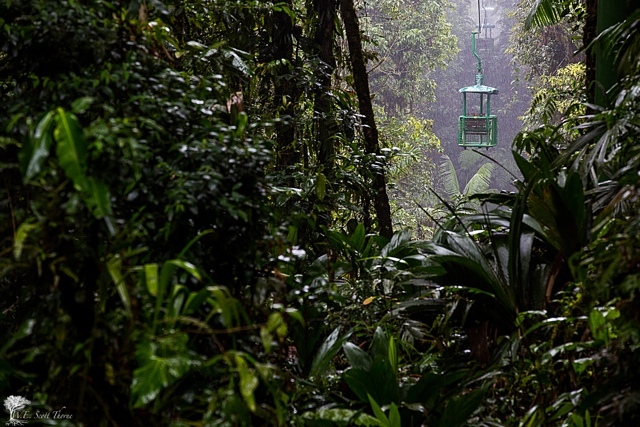 A view of the trams moving through the treetops of the Braulio Carrillo National Park. 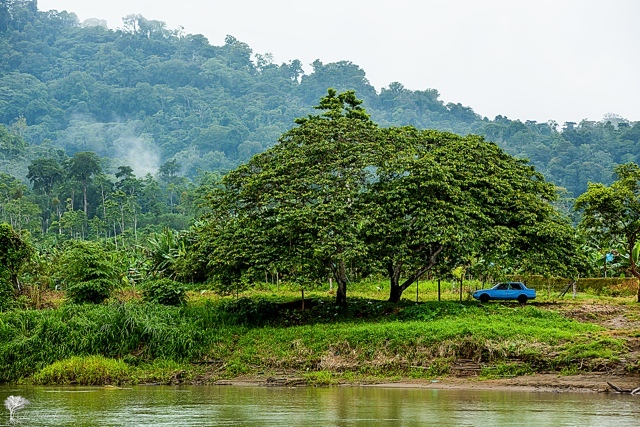 Panama as seen from across a river in Costa Rica. We were so close that we paid $1US to get a 2 second boat ride over to the other side just to say we visited Panama. 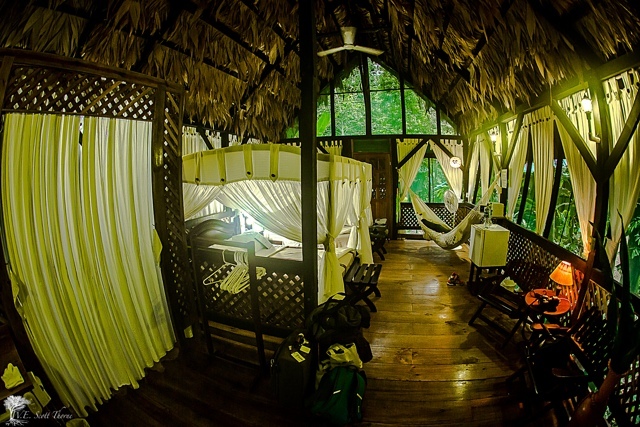 One of our first hotels was the Almonds and Corals an eco lodge where each room is its own large tent with thatched roof on stilts and the walls are made of screens, with only curtains for privacy to the outdoors. 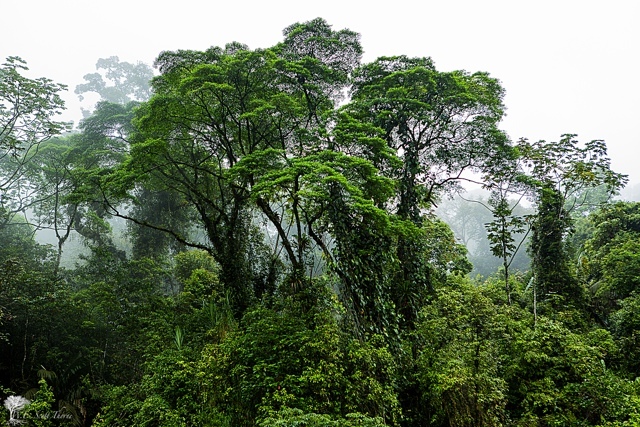 It was really relaxing to sleep listening to the noises of the surrounding rainforest and the rain pouring all around you. Scott and I were lucky enough to visit a local Bribri village where we learned how to make chocolate. 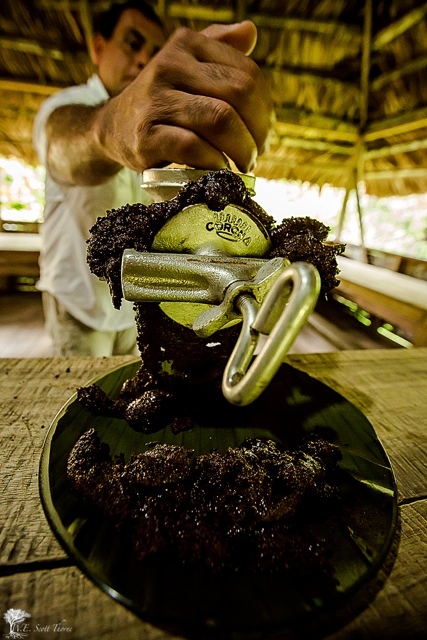 Part of the process was running the crushed coco beans through a meat grinder to bring out the natural oils. We also visited the Jaguar Rescue center where they have also rescued adorable monkeys like this guy. 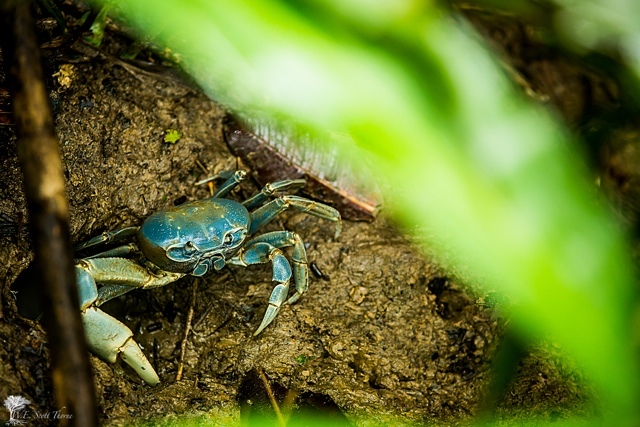 Along the pathway to the beach at the Almonds and Corals Eco Lodge there were hundreds of these blue land crabs that would run into their underground burrows when approached. 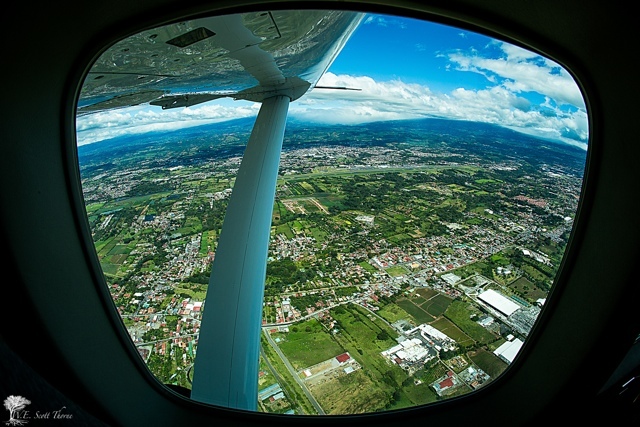 Flying over a mountainous area in the center of the country. Those are just a few of Scott’s great photographs from our trip, stay tuned for more including more adorable Sloth photos if you can handle. Check out more of Scott’s photography on Instagram. 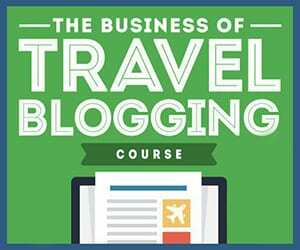 Thanks go out to Costa Rica Tourism, Latitudes Adventure and Samsung for making this trip possible. As always all thoughts and views expressed are my own. The hotel looks awesome – almost like it was put out of a dream or a fairytale. In the treetop, with hammocks and candles. Where did you find such accommodations? 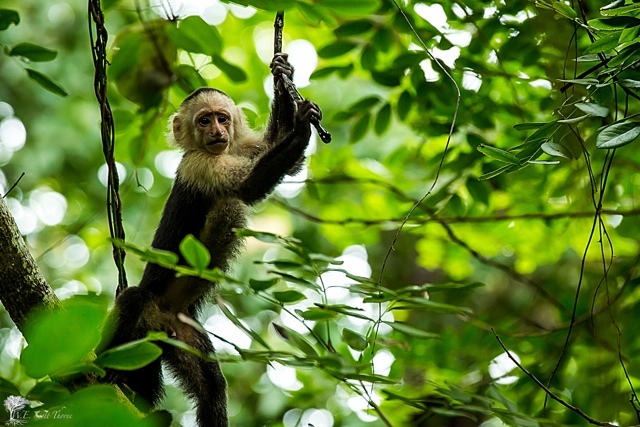 I am planning a trip to Costa Rica since years. Even in my time as a student I saved 30$ a month. LOVE the pics! Especially the monkeys. We took that same aerial tram and loved it. 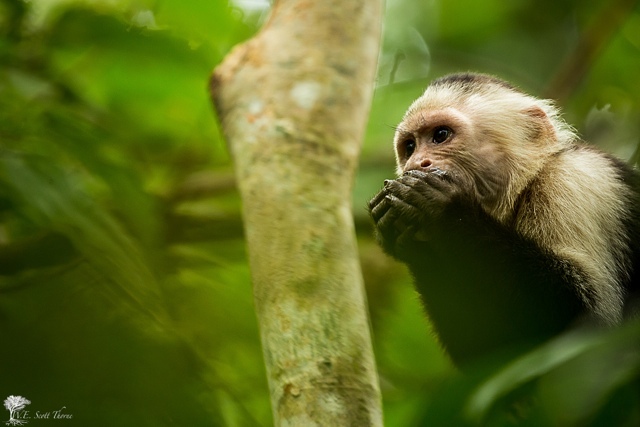 But we could only hear the monkeys – didn’t see them. But we did see a sloth and a toucan. 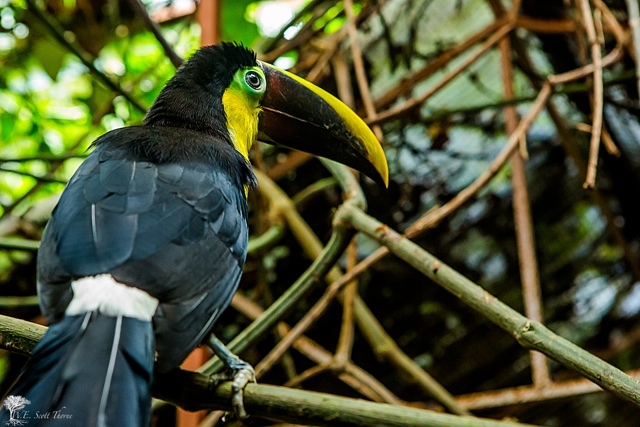 Costa Rica certainly is a nature lover’s dream come true. Thx for sharing. Yes, really stunning photos! I love the images of the frog on the leaf and the oily, ground chocolate. I’ve never really thought about going to Costa Rice before, but it looks pretty amazing. I havent been to CR in 8 years but it looks just as beautiful as it did then. Cant wait to return in a month! What did you think of Arenas del Mar? I’ve read a lot of great things.